Tom, Kevin DeLonay’s truck is about 40 seconds into this video. Tom, Please come to Argos this year! I think it would be worth your time and trouble! Tom, even if you can’t get the truck ready, come anyway on petrol. Would love to see you again and you have enough in your head to share. When things don’t go according to plan it pays to be creative. 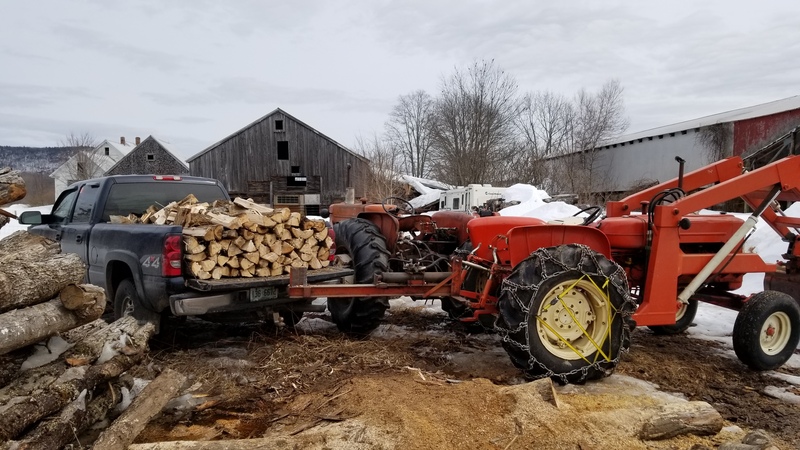 I broke the drive shaft for the loader tractor my D15 hydraulic pump yesterday and wanted to get a load of wood split today anyway before my mechanic can help get it fixed this weekend so out came my d17 she has sat since last fall but fired on the first spin over. But the D17 doesn’t have a 3 point hitch to hold the splitter. So 2 tractors and a pickup later I have a load of wood for the day. I hope we don’t get too much snow this weekend because I don’t have a way to run the loader and move it. Guess I will have to have a friend plow me out if we get the foot of snow they are predicting. Hi Tom, I bought Wayne’s book a few years back and just started building. I never really went on the forum don’t ask me why, I guess I didn’t realize everybody was sharing their builds. I guess I thought it was no big deal I figured everybody was building a wood burning truck in their garage. Looking forward to meeting you in Argos,seems you’re a bit of a legend here! The wife and I bagged 30 sacks plus some buckets of wood. Then spread more out to dry. I am working on my wood right now hoping to get my wood shed filled before my spring work kicks in. But your money in the bank comment rings so true there is nothing better then the feeling of knowing you have you wood or garden canning or whatever done and that you don’t have to worry about how you will buy something. Yup, with a week of daytime thaw my backyard woodpile showed up again. Continued where I was interrupted a a few weeks ago. A few hours of Sunday splitting and stacking boosted my feel-good chemistry. Read a book years ago called “Wood”. The writer’s neighbour was a 90+ year old man who had a truckload of wood dumped in his yard early spring. Winter had been long and harsh, and during that time the man was only seen with a bent back slowly stumbeling to his nearby mailbox and back once a day. Day after the wood arrived the man started working his chainsaw and splitting axe. At first only half an hour a day, but after a week or so working hours got longer. A couple months later and by the time grass started to green the man was seen vigorously raking the splinters up. With no effort he then, traight-backed and with a smile, walked over to inspect his perfectly stacked wood drying. 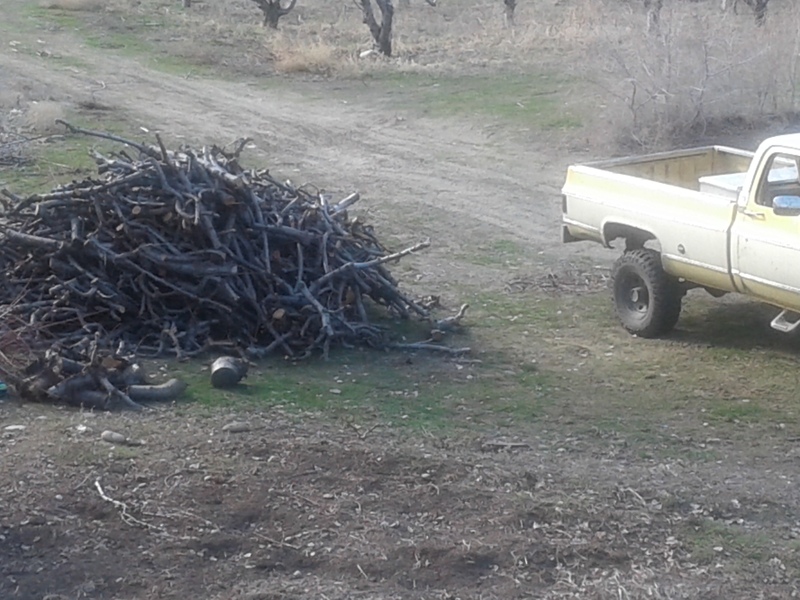 Two hours of work taking this year’s pruned wood off the cherry orchard wood pile. The small pile in the back ground is old wood. My friend Mike helped me. Roy the orchard manager told to get all the I want, he has to burn the pile this year, many, many cords of wood will go up in smoke. May be there will be some charcoal left when they get done with the burning. 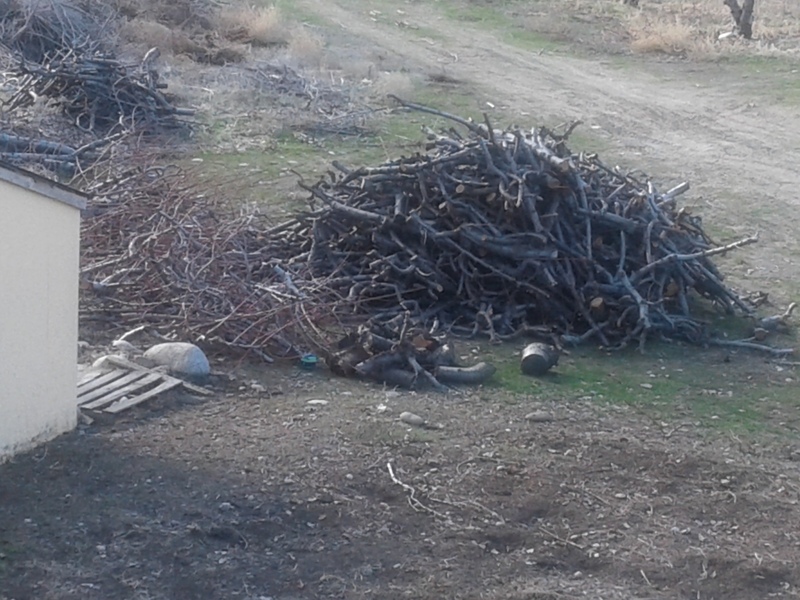 Hopefully I will have a pile twice as big of the old wood before they burn the pile. Need to start chunking wood. I was just wondering if you could do the chunking onsite it would definitely speed up the process if you could just bring home the chunks not all the bulk of limbs. The wood sit on blow sand hill, I think my chunker would get stuck towing it to the wood pile. 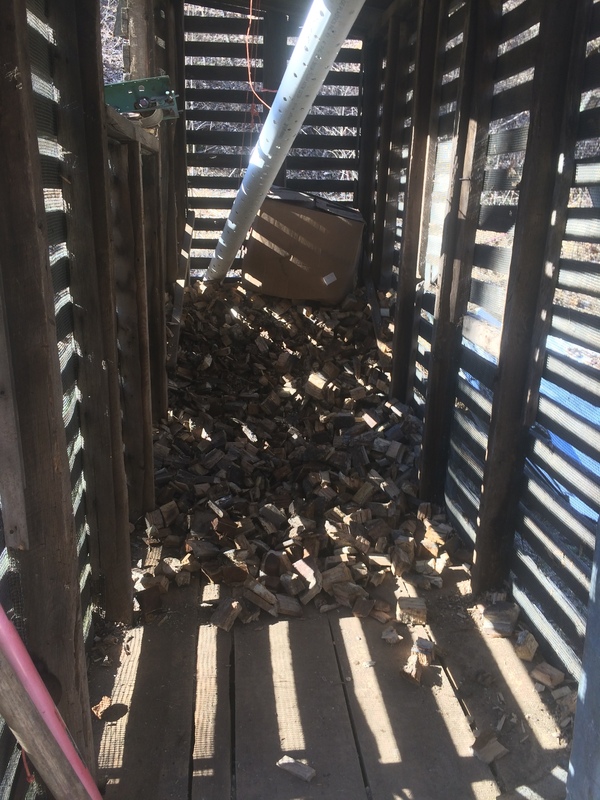 With the dry wood I can chunk it, bag it, and store it under the shelter next the the chunker. We used Mike’s wench to pull the long dry limbs that were in the pile. Why not make charcoal near the burn piles using a slight depression in the ground, or some barrels or other tin. When I constantly add wood to my 55 gal drum after the bottom vent holes are covered, it acts as a flame cap kiln, and I end up with over 2/3rds of a barrel of charcoal. It takes about 25 gallons of water to extinguish. After I added water to the last barrel I made a few days ago, the water was right up to the rim of the barrel, but the next morning the water was all gone. There were only a couple of brands from some ten inch diameter hunks added toward the end of the burn. You would just have to haul water to the burn site, spend about 3 hours in the early morning feeding the fire, and then extinguishing the coals. Invite a friend to help. With help, you could run two barrels at once, sitting a few inches apart. (Need room to cover the vents with dirt when those holes start glowing.) I recently ran two barrels at once, but my 75+ year old bones got wore out. Very nice setup Mr. Al thanks for the pictures . That is so cool Al, I want to set something like that up for my wood drying crib. I like the conveyer belt setup to the wood crib coming from your wood chunker. Just a quick question, does the exhaust from a Dakota smell like a campfire or barbecue normally? I’m sure it would smell really nice if you put some apple wood in the gasifier. Thanks, Tyler. Al, I like your setup. Is that a perforated pipe for ventilation inside? In my cribs, even though they are on a south wall, the chunks don’t dry fast enough to prevent mold unless I pre-dry them on the trailer. Last fall half a dussin old windows followed me home. 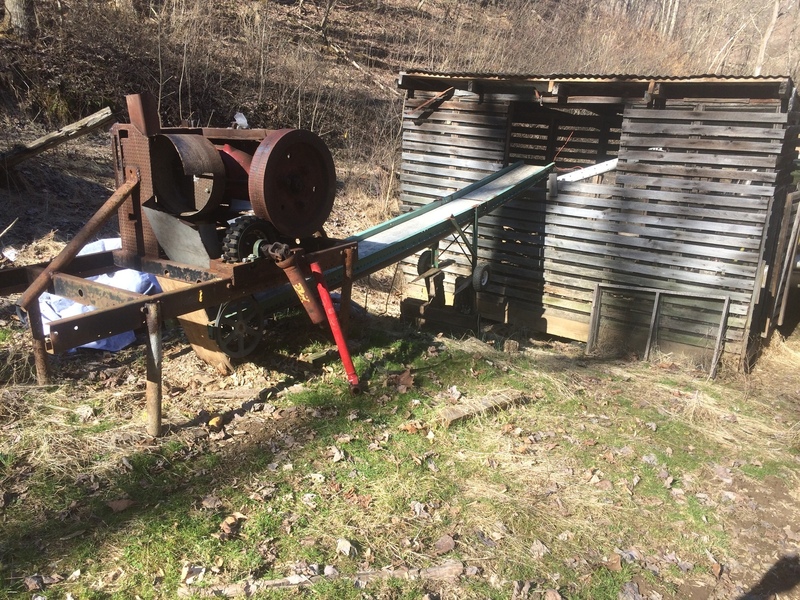 If I get the time this summer I’ll try to make a solar drying-kiln with a center ventilation. Jo, yes that is for center ventilation if I ever fill it full enough to need it. 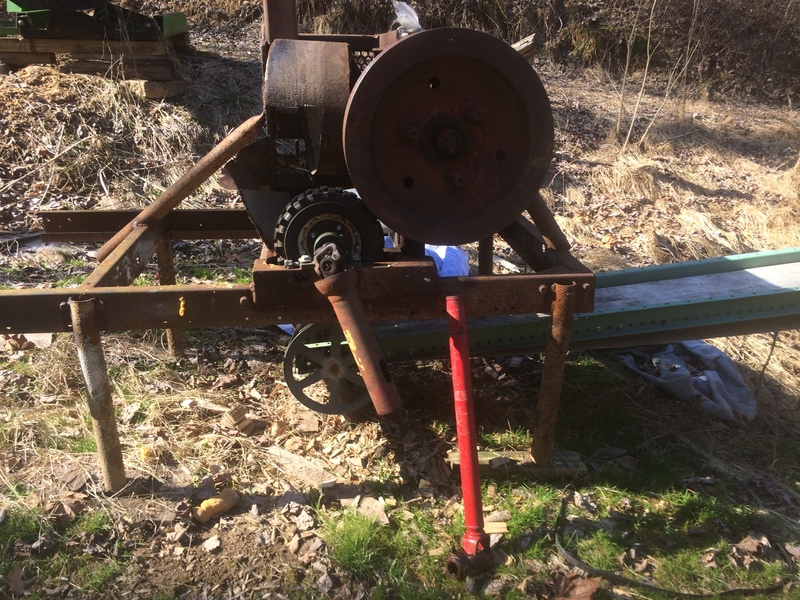 My sawmill is above the chunker, so I can trow the slabs down to it.